Um... he was growing concerned. He knew Boapaw had left with Lavenderskies today to go gift the Tribe of Rushing Water in return for their gifts last week, but... it had been about a day or so now after they had left and he was growing rather worried. He knew it would take awhile... but not days. There was no way his sister would want to of been this far away from her nest for so long either... he was beginning to fear something had happened. He had heard cats whisper about how long it was taking the pair but never anyone full on deciding it was time to consider that... maybe something happened? Maybe? His biggest fear was that... they weren't coming back. He had already lost all his kin, he didn't want to lose his sister now too... He wouldn't know what to do. So padding over to the center of camp he looks wearily around, ears flattening. "Um... guys? How long do you think it'll be till Boapaw is back? I'm getting scared... and Lavenderskies too." He would meow with a nod. Maybe he was just silly and it did take an awfully long time to travel to and back from the tribe. ― Mothpaw's anxiety about her mentor's whereabouts had grown as time went on. She hadn't ever visited the tribe before so she thought perhaps she had just underestimated the time it took to get there and back. She had no frame of reference after all. She hoped she was just worried for nothing. She tried to push the thoughts away, going in for a bite of the mouse she was busying herself with eating in the camp's clearing. Lavenderskies and Boapaw would be back before she knew it. Only now she didn't seem to be the only one worried. Buckwheat's inquiry raised her previous suspicions again and she pulled herself up into a sitting position. Her eyes wandered towards the camp's entrance, as if hoping the pair would walk through it at any moment. "They'll have to be back soon...right?" Mothpaw was frowning, worry making her voice a tad higher than normal. She didn't want to think about the possibility that something bad had happened. Would they have to go search for them? What would Minnowstar say if too much time went on without her deputy? She'd be the first to volunteer to go looking if it came to it. A hundred thoughts seemed to be bouncing around the young molly's head. She had complete confidence in Lavenderskies' abilities...if something had happened to hold them up it must have been significantly bad. "My mom doesn't go one day without warning me for being mean," Juniperpaw remarked, coming to a halt beside Mothpaw and offering he a worried glance. Much like her, he'd never visited the Tribe and did not know what kind of cats were housed there... but if they'd done something with his mom, StarClan help them they would pay for it. No doubt he would charge in, teeth and claws bared in anger and mercilessly fight them in vengeance for whatever they had done. He dreaded to think what kind of thread would down his mother, would cause her to leave like this, but... he knew that he'd fight it, no matter what. He had to. Ever since his dream of Mothpaw being attacked, Juniperpaw had felt an underlying need to protect the few he loved until he died in the process. He couldn't stand and watch like he had done in the dream; no, he had to fight. And he undoubtedly would. "I've been running my mouth as much as usual today and I haven't seen her anywhere. And... well, she's your mentor Mothpaw, so... if you haven't seen her then..." he trailed off, his tone becoming slightly panicked. Minnowstar enters the conversation of the younger cats. Until now, the leader hadn't been all that worried that it was taking a day or two longer than usual for the small patrol to return. She had made the journey enough times to be able to travel back and forth before the day grows long, but knew not everyone had that talent. Or want to move so fast. It wouldn't surprise Minnowstar if they decided to stay among the Tribe for a night or two just to recover from the journey. So if Minnowstar is worried, which she is beginning to be, she isn't showing it. "I'm sure Lavenderskies didn't want to move too fast and run young Boapaw ragged," Minnowstar comments gently, before adding, "Though if they don't return after tonight, I will send out a patrol if it makes you all feel better. I will go to the Tribe myself if I have to." ✧ — "If you don't mind Minnowstar then I want to come along if a patrol is sent out." Dottie piped up, overhearing the conversations that were flickering back and forth. Lavenderskies' absence certainly hadn't gotten overlooked by her, after all the deputy was such a busy bee, constantly zooming around camp. She had missed her friend too, having not had anyone to speak deeply with for awhile. what a time, what a time, what a time. ✦ ✧ ✦ concern marred the pretty gaze of the young molly as she trotted up behind her brother, head tilted, brow furrowed. "i'd like go too, if it's okay with you, minnowstar. if i'm not too young." if her mom was stuck or trapped, she wanted to help find her. it had been a while since she'd seen the familiar pelt of the deputy, and worry had started to set in. "maybe they decided to stay an extra few days. to rest." yet her tone wasn't convincing, to neither the group nor herself. // this is an oof post i'm sorry. Trotting over to the conversation, Whitenose stopped beside Buckwheat, pressing his shoulder against his mate's and nosing gently at the other's neck in comfort. Glancing over at his mother, Whitenose's ears perked up slightly at the idea of a patrol going to the Tribe. He was familiar with the territory and could aide them in searching. "Mother, if you send out that patrol I'll go along as well." Turning his calm gaze on Buckwheat, Whitenose kept his expression gentle and tried to reassure his mate. "They'll be fine, you'll see." "put me in the dirt; let me be with the stars." Lavenderskies? The same Lavenderskies that had basically plucked her up off of the side of the road and offered her an at least temporary place in SkyClan? The same one that had been her third every interaction with another living, breathing feline? Personally, Blink hadn't noticed her gone for that long. Then again, the injured feline spent most of her time within the confines of her nest, both to rest as well as to avoid the busy SkyClan camp--well, at least busy to her. That paired with her lack of knowledge of clan life, it made sense that the young tortoiseshell wouldn't notice the absence of the deputy, let alone Boapaw, who she had never spoken to, even after spending some time in the camp. 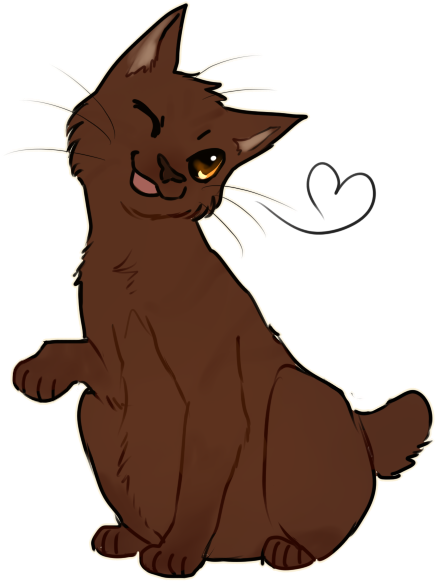 Frightened by the commotion, the small cat could now be seen peering out of the den in which she resided--the apprentices' den, she gathered, as that's what most of the SkyClan cats seemed to call it. Her rabbit-shaped ears perked up to allow the shy feline to listen from afar, hoping that none of the surrounding clan cats would notice--or at least she wouldn't get in too much trouble for it. Sure, she was worried for the cats (though, despite her not being able to admit it herself, mostly Lavenderskies), but her nerves would always win, and thus she found herself unable to volunteer for the patrol to try and find them. blink / ☾ / apprentice of trad. skyclan / ☾ / penned by lyn.